Love the heart strip, the heart cut-outs, title and of course that cute little face in those photos! Super cute page! 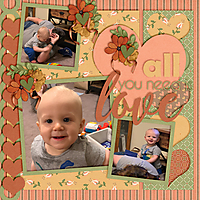 Lovely background you've created here, Lynn, to pair with those sweet photos! Love your title work.